Part 3 of the canine detox uses micro-minerals and superfoods as natural cleansing agents to oxygenate your dog’s body help trapped toxins and allergens move freely, allowing them to be easily eliminated by the body. This formula supplies a wide range of antioxidant ingredients to foster the maximum reduction of free radical damage to cells. Categories: Supplements, The Transform Detox Tags: best dog food for boosting immune system, best immune strengthener for dogs, best immune supplements for dogs, best immune system booster for dogs, boost immune system in dogs, dog food immune system booster, Green Juice for Pets, immune system foods for dogs, immune system supplement dogs, immunity boosters for dogs, Immunity Support for Dogs, improve dog's immune system, Spirulina for Dogs, The Daily Multi-Vitamin Powder for Pets, ways to boost a dog's immune system	SKU: immunity-support-for-dogs. Immunity Support for Dogs: Powered by superfoods, the Green Juice portion of our detox system continues the detoxification process while infusing your dog’s body with micro nutrients to help him continually rid his body of toxins. All of these nutrients are highly absorbable and easy for his body to transform into the energy he needs to not only bounce around playfully, but to also continue to eliminate toxins from his body. When your dog can easily absorb the nutrition he needs, he will no longer be at the mercy of toxins and irritants that cause him to age prematurely. Immunity Support for Dogs: High quality ingredients are the key to nutrient-density and excellent health. PWZ Green Juice for pets floods the body with 100% bio-available, highly absorbable nutrients and enzymes specially chosen to provide the essential vitamins and minerals that animals are deprived of in their dry, wet, and raw foods. Without proper nutrition our pets are faced with the challenge of hyper- aging, pain, lower energy, immunity, and overall health. 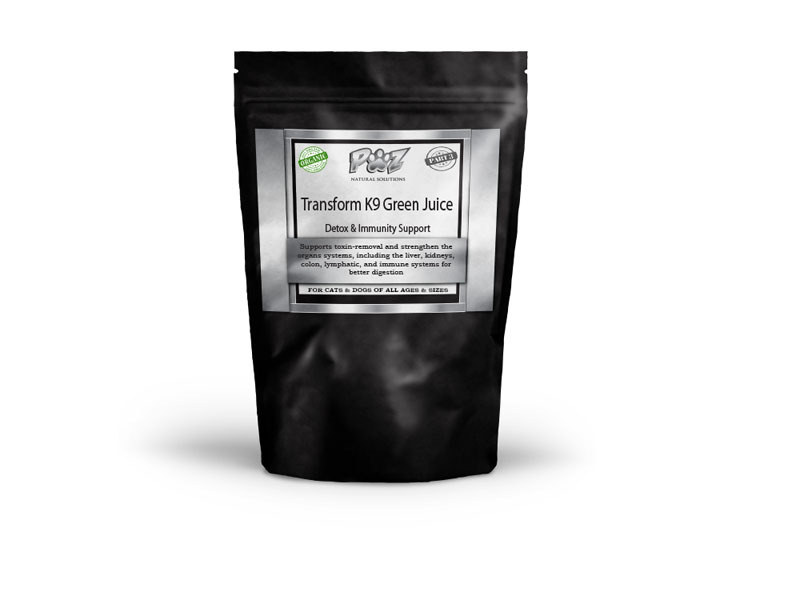 To effectively improve and prevent conditions such as these, PWZ Green Juice has provided a blend of the earth’s most trusted, nutrient-rich, certified organic Super Green Foods in one unique multi vitamin blend to gently detoxify, improve immunity, boost the metabolism, and alkalize(raise the PH) the body. This whole food supplement has been proven to reverse lethargy, banish allergies and yeast infections, improve bad breath, condition the skin and coat, and decrease pain and inflammation in the joints. It’s truly a quintessential addition to any type of diet commercial, raw, or homemade. If your pet has chronic allergies, very poor digestion, or is suffering from a serious illness and is in need of a more substantial detoxification with all of the same benefits, please see our V-flow daily detoxifying powder for pets. This simple yet potent blend of micro-algae and minerals creates a bio-available plant based multi vitamin to help your pet reach the peak of health. It’s rich in essential trace minerals, vitamins, and amino acids, which are normally missing from your dog’s diet. It’s perfect for encouraging tissue repair, a healthy thyroid & Immunity Support for Dogs and other vital body processes. Target animals include: Horses, cattle, pigs, sheep, goats, dogs, cat, poultry and birds. Spirulina: Spirulina is a blue-green algae that’s rich in vitamins and antioxidants and at 16 grams a serving, is chock full of protein. It contains a balance of all 9 essential amino acids and is more digestible than other rich protein sources such as red meat and even soy. It contains chlorophyll which is used for detoxification by helping remove toxins such as heavy metals and other pollutants from the blood. Spirulina also stimulates the immune system, increasing production of antibodies, and promoting a healthy response to allergens. Wheatgrass: Wheatgrass is the best form of living chlorophyll. It has twice the amount of vitamin C & A as carrots and oranges, it’s rich vitamin B, as well as calcium, phosphorus, magnesium, sodium and potassium in a balanced ratio. As a powerful detoxifier it uses enzymes to eat away at bacteria, heavy metals, and pollutants hiding in the body’s tissues, lessening the effects of radiation and chemotherapy, preventing inflammation, treating allergies, autoimmune disorders, tumors, parasites, and more. Green Pea Protein: Green Pea has more iron than spinach, more protein than an eggs and dairy, and is completely vegetarian and bio-available. This type of protein is rich chlorophyll and fiber to help gentle cleanse and nourish the entire body. Perfect for animals who are protein sensitive and are prone to allergies and yeast infections. It also helps calm inflammation and pain in the body. Can be mixed with food or water. Note: It may be used (as far as is known) during pregnancy and lactation. It is administered orally, preferably in the feed, drinking water or milk. This product will interact with certain medications (especially estrus suppressant drugs) preventing their absorption. There is no worry of overdose. Shelf-life: In excess of 3 years. Special precautions for storage: Keep well sealed during storage. Potassium – It is a mineral that is very essential for your body to work properly. It is an electrolyte. It is essential to control acid-base balance and heart electrical activity, maintains the growth of your body, build proteins and muscle, and the use and consumption of carbohydrates. Sodium – It is important for the body to function properly. It regulates bodily ph and maintains the health of muscles and nerves. Vitamin B – This complex plays an important role in the metabolism of cells and effect to the different physical functions of your body. Vitamin C&A – Vitamin C is a water-soluble vitamin, which is necessary for normal development and growth. Vitamin A is commonly known as the vitamin which is necessary for good eyesight. Magnesium – It is needed for all living cells and it is compound for many biological reactions which involve the release of energy. It is important for usual metabolism of phosphorus and calcium. Copper – It is an essential trace of mineral. It promotes the metabolism of your body. Iron – It is the chief trace element needed for your body. It is important to the oxidation process in your body. Sulphur – It is the 3rd abundant mineral in the body, after phosphorus and calcium. It helps with clearing the skin and is anti-bacterial. Phosphorus – It is an essential constituent in each body tissue. It is mineral, which perform a number of essential functions. It is not only necessary for the growth of the skeleton but it is also essential for its maintenance. Silica – It is the most abundant element on Earth aside from oxygen. It is needed in order to have healthy body. Calcium – It serves two essential functions in your body which are the building of teeth and bones. It can help also to regulate certain processes in your body. Puptection Automatic Shipment scheduled delivery option is designed to ensure you always have the freshest possible pet food for your dogs and cats when you need it. The flexible auto-ship program allows you to choose how frequently your pet food and treats are delivered to your door. Looking for a way to cut cost and save time? The Auto Ship Program helps busy pet owners just like you save valuable time and money on the pet supplies they need, when they need them. The option means no more worrying about running short of food or ordering more supply than you need. Many of our customers have a set monthly (or weekly) budget for their pet food and treats. The Auto Shipment option perfectly complements to a fixed budget, as you can set the delivery schedule up to know exactly how much you’ll be spending per week, per month, per quarter, or whatever system works for you. • Convenience of door-to-door delivery. • Ease of setting up delivery & FREE shipping on $99+. • Flexibility to adjust & manage delivery schedule. • Peace of Mind never run out of food, litter, or pet meds. • Convenient: Choose your own delivery schedule. Never run out! • Smart: Getting food delivered saves you time, sweat and MONEY! • Flexible: Easily change products or reschedule your order. • Commitment-free: You can cancel at any time. How do I change a scheduled shipment? Call 1-312-278-9205 to postpone scheduled shipments, change your frequency, and update the quantity of any items in your account. You may make modifications up to 5 days prior to your next scheduled shipment. All items will be shipped via Economy Ground Service. If you have multiple ship-to addresses on file, items shipped to different addresses – even on the same day – will be billed separately. If you would like to have this product shipped to you on a regular basis, please select how often you would like it shipped to you using the boxes below.